As the weather warms up, take your teatime outside! 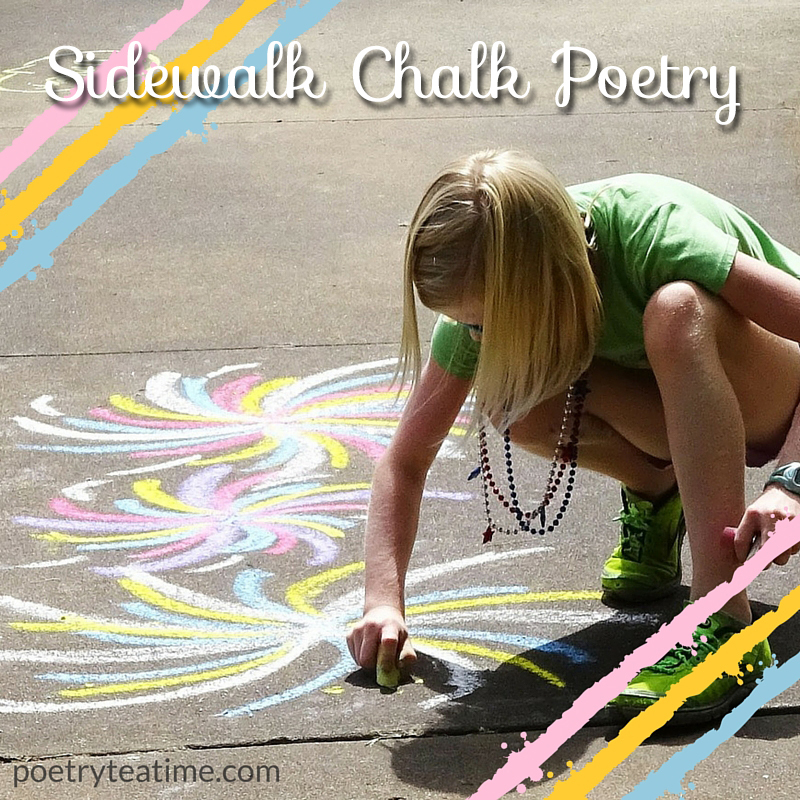 And, while you’re at it, try out these fun and easy ideas for sidewalk chalk poetry. After all, poetry and sidewalks go well together--just look at Shel Silverstein’s Where the Sidewalk Ends! In the first, everyone starts by picking a poem. It could be a favorite poem (choose something short!) or a poem you wrote yourself. If possible, involve everyone in this--and invite your neighbors, too! The more people and the more poems the merrier. Once you’ve chosen your poem, write down the first one or two lines on the sidewalk. You can write more than one poem--just don’t write down more than one or two lines. After everyone has written down a poem or two, play a game in which the objective is to “finish” all the poems by adding lines to the poem. There are two ways to add lines: either write down the next line correctly (as close to the original as possible) or creatively (something that matches the spirit of the poem but is funny or imaginative). Each time you add a line to a poem, you get a point. The poem “ends” when it reaches seven lines. To win the game, race to see how many poems each person can finish before the time’s up. Read the poems and share which lines are favorites. 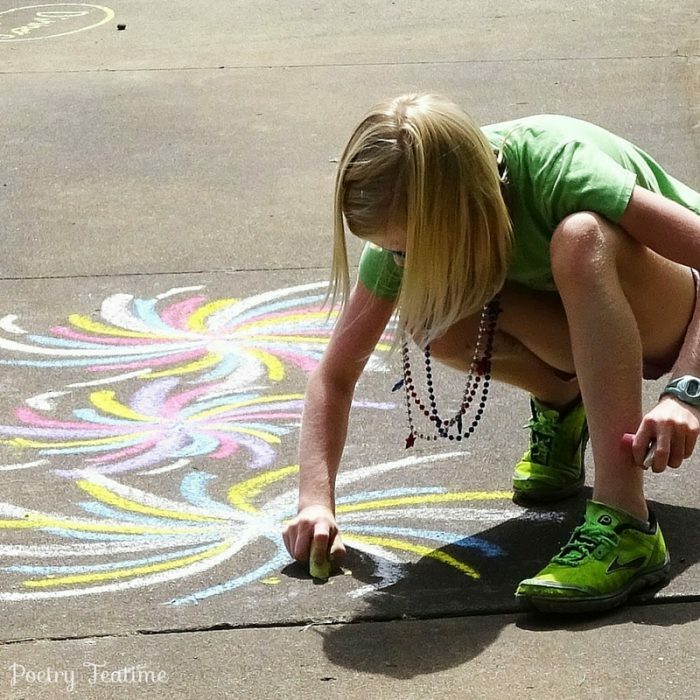 A second variation of sidewalk chalk poetry involves more traditional sidewalk art. First, doodle whatever shapes you’d like. Experiment with squiggles or stick figures, swirls or snails. Then, in your notebook or on the sidewalk, write a poem to go with the shape you drew. This second activity is easier to do with all age groups, and can be combined with a game to see who can write a poem involving the most shapes at once. A third alternative is to write down your favorite poems along the sidewalks for everyone to see. Make it an illustrated gallery of poetry by drawing images to go along with each poem. Your sidewalks will be the most artistic ones for miles! Check out these other sidewalk writing activities.